Marine Corporal Garrett J. Carnes lost both legs after stepping on a pressure plate improvised explosive device (IED) while on a patrol with the 3rd Battalion 3rd Marines in Khan-Neshin, Helmand Province, Afghanistan on Feb. 19, 2012. 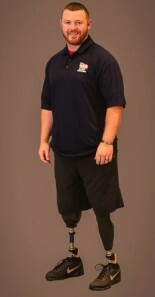 Cpl Carnes underwent more than 30 surgeries from the time he was evacuated to Camp Dwyer to his time at Walter Reed. During his recovery, he made a goal to be walking on prosthetics by the time his fellow Marines returned home from their deployment. After only six weeks of physical therapy, Cpl Carnes greeted his returning comrades standing on the tarmac. He credits his wife Courtney with pushing him through his recovery. Despite his determination and ability to overcome obstacles, Garrett still experiences everyday limitations. He and Courtney now have two sons, Chase and Easton. But fatherhood places new challenges on Garrett. He says ordinary tasks in his previous home, like feeding and changing his son were “like science projects.” Additionally, their former home had all carpeted floors, making it difficult for Garrett to get to his sons in the middle of the night in his wheelchair. The doors were not wide enough for him to get through while in his chair without his hands getting caught, and he could not reach everything in the kitchen without his wife’s assistance. “It’s belittling not being able to do what you want to do,” he says. Garrett says his new specially adapted Homes For Our Troops home allows him to be the man of the house again and increases his confidence. Courtney says she lives her life more peacefully, being able to leave the house without worrying if Garrett will need her help. The Carnes chose to build their home close to their family in Burlington, N.C. Currently in school pursuing a business degree, Garrett says a specially adapted home gives him comfort and stability at home and allows him to focus on his career. Carnes is grateful to HFOT’s donors and supporters for making his specially adapted custom home a reality. “The best part about our home is there are no physical obstacles when it comes to raising my sons now. When simply wheeling out of my front door used to be a project, I now get to enjoy mornings out front watching my two children and listening to the birds while sitting next to my wife, and feel no frustration of scraped doorways or jammed fingers. The little things really go a long way toward feeling comfortable,” he says.